RNLI New Brighton have saved over 1235 lives in this area since founded in 1863 and currently operate a hovercraft in addition to their high performance lifeboat. All films start at 7.30pm. Doors open at 7pm. The New Brighton Heritage Centre is now situated in St James Church, Victoria Road and is always worth a visit. It’s staffed by volunteers most days and provides a wealth of local history information. We need more Volunteers to help keep the Centre open. If you can spare 2 hours a week to help, phone Rusty Keane on 0151 639 5798 (the Centre opens Mon – Sat 11am – 4.00pm and Sundays 11.00am – 3.00pm when Volunteers are available. Come and have a cup of tea, have a look at the information we have displayed and, perhaps, watch one of our local history DVD’s. We look forward to seeing you. Local history talks take place usually on the first and third Wednesday of the month at 2.30 pm. Admission £2. After a refreshing summer break we are now looking forward to committing ourselves afresh to the task of evangelisation so that we can share the good news of Jesus Christ with everyone! To arrange Baptisms, Weddings or Funerals please contact Fr Phil or Fr Michael on 0151 606 4362. After almost 11 years in New Brighton parish I will be leaving for pastures new – as Team Rector of the Halewood and Hunts Cross team of parishes in Liverpool Diocese. After 1,300 services, 80 baptisms, 30 weddings and 280 funerals it is time to move on. I was 48 when I arrived, and close to 60 when I leave. I’ve changed a lot, the church has changed a lot, and the parish has changed perhaps most of all. When I came in 2004 New Brighton was continuing its slow decline of previous decades. Today it has a ‘seaside’ buzz, lots of day trippers, new attractions, and a new level of optimism. Places change, as do churches. Some local churches have closed, some (like the ‘Dome of Home’) have closed, and re-opened! Others, like our own St James, are being restored and renovated. I have to say that the present climate is not an encouraging one for Christians, and we struggle with our out of date, and too large, buildings. But our churches are not buildings – they are people. It has been said that Christians are short-term pessimists and long-term optimists! That is true. We can’t be otherwise, as Jesus said “I am with you until the end of the age”. He is in it for the long haul and so should all those who claim the name of Christian. New Brighton has had its ups and downs, the churches will also – but I hope and pray all his people in New Brighton will remain long-term optimists! Jesus is with us, and seeks to bless us in ways beyond our comprehension. How can we be downhearted? It’s a journey he is calling us all to join in, to follow him and become a disciple – flaws and all! He doesn’t call perfect people – he calls real people you and me. Goodbye and may the Lord Jesus bless you all in this beautiful place on the River Mersey. Over the last few months our station has received awards for bravery for crew members and long service awards for fundraisers. R NLI recognize two rescues on 21st June 2014 – A letter of appreciation was received from the Head of Community Lifesaving Delivery. The two incidents on the same day covered a rescue of a small yacht that had lost power and steering with 4 people and dog on board and was in severe danger of founding on on a breakwater. The second incident involved the rescue of two teenage girls who were swimming and caught in a rip current. The girls were in the water, clinging desperately to the rocks of the Perch Rock breakwater and in a very distressed state. Snr Helm Dave Lowe took the lifeboat to the seaward side and put Crewman Mike Plaskett went into the water to safeguard and reassure the girls and help with transferring them onto the lifeboat. It was difficult to see and maintain position beam on to the breakwater with the choppy sea which was causing the lifeboat to rise and and fall significantly. With difficulty we managed to haul the girls on board one at a time then recovered Mike. R SPCA Bronze Bravery Award – presented at The RSPCA Honours Award Ceremony in The Law Society buildings in London, on Saturday 16th May. This referred to an incident on 24th February this year when the lifeboat launched in dangerous seas to the rescue of a small dog. Dave Lowe and crew succeeded in rescuing the distressed animal and got it to shore unfortunately it did not survive. The crew put their lives on the line not just because they are animal lovers but their was a significant risk of humans being willing to go into the dangerous sea to attempt rescue. Had they done so their survival would also be in doubt. R NLI Gold Badges awarded for 50+ years dedicated fundraising for New Brighton – without the support of our fundraisers our crews could not do what they do. New Brighton lifeboat Chairman Tony Jones presented the RNLI’s Gold Badge award and Certificate of Thanks to Rita Richards & Selby Williams, both veteran fundraisers, in recognition of their dedication and support to the lifesaving charity. 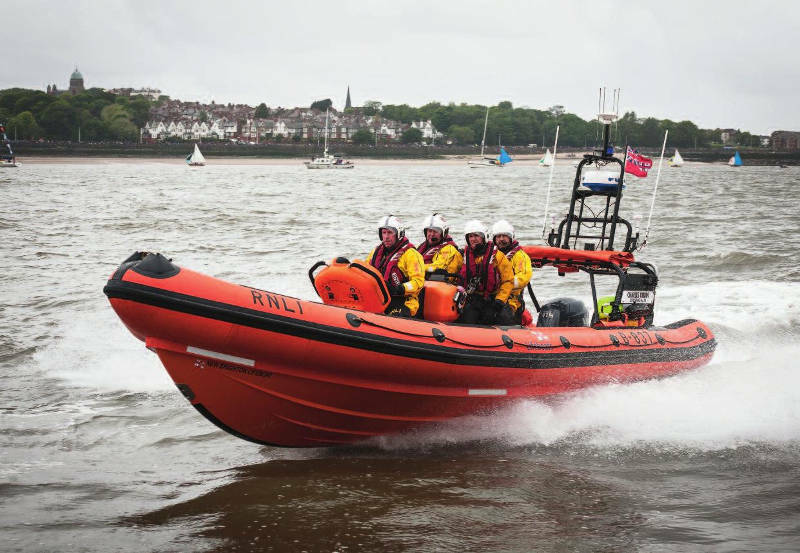 Both are members of the New Brighton Lifeboat Fundraising Branch, previously known as the Wallasey Ladies Lifeboat Guild, who are dedicated to raising funds for the New Brighton lifeboat station through activities like collections and coffee mornings. New Brighton One Stop Shop – is open Monday to Friday from 11am till 3pm. This is a great service that provides invaluable help for local people right on their doorstep. It also includes a free phone facility and private rooms with a loop system for those that are hard of hearing. It provides assistance on all the Wirral Borough Council services including the Pension Service, Age Concern & the Citizens Advice Bureau (CAB) which also operates advice surgeries once a week for the Polish Community and offers them vital assistance. Love your Business (The Women’s Organisation) – Invite you every Wednesday 10am – 12 noon to find out about grants and support available to you! Lunch Club – this provides a lifeline for those people & families on low incomes as well as elderly people. It is a great way for people to get to know each other and make friends in a very friendly environment. It also provides days out to places of interest; the latter is kindly provided by Wallasey Lions Club. Lunch is served Tuesday/Wednesday, Thursday and Friday from 12.30pm and a 3 course meal is only £3.99 with a mug of tea or coffee. You can come in from 12noon and make yourself comfortable with a read of the free newspapers. This group was established in 1992 to support people, their family and carers, for whom depression, anxiety and mental health problems are part of everyday life. It has gone on to help hundreds learn to manage their problems, building up their self-esteem and confidence, helping them to remove their feelings of isolation. The club meets every Thursday – 7pm – 9pm and a very warm welcome awaits all those that come along. Computer Suite – This service offers local residents looking for work’ free internet and email addresses. It’s a valuable resource where residents can get help putting together CVs, job applications, advice on free travel and searching for jobs. They can also enjoy a cup of tea/coffee and seek the assistance of the ICT Facilitator should they have any problems or need further advice. Residents can also scan documents, use the photocopier or fax. A local Neighbourhood Police Surgery is held every Monday morning 10-12pm for residents experiencing problems with anti social behaviour and other associated problems. Computer Class the clubs aims to help people with all aspects of computing including smart phones and tablets. Every Monday 7pm – 10pm. Art Classes – Every Monday 1pm till 3pm. Accent on enjoyment rather than talent. Tuition at all levels, all materials provided. Phone Iris for more details on: 638 8472. Monday: Sunday was a blazing hot day, and so it was busy in New Brighton. I wander down to the beach first thing with Picker and Bags. As expected the haul of plastic and glass bottles, empty crisp packets, solied nappies, odd items of clothing, drinks cans, beach toy netting and baby wipes was about average, which means there was a lot! There is some dog poo as well. Don’t pick dog poo. Much too squishy! Tuesday: As the half-term holidays are over, weekday litter is not such a problem. I wander down for an evening walk. Just want to have a non-picking walk and watch the sun setting. But some folks have had a beach party on the rocks near the Fort. There is an empty box of 3 Beef and Onion pies, plus 11 empty glass bear bottles scattered around, 5 drinks cans, 2 polystyrene fast food containers. They also left 4 single use plastic bags, which was very considerate of them. Fill their bags with their litter and put it in the bulk bin nearby. Something they could have done themselves, but didn’t. Why is that? Wednesday: For an unexplained reason, I couldn’t face going for a walk this evening. Thursday: Watch an interesting YouTube video about how plastic gets into the food chain, and how we can end up eating it. That is one of the reasons I am part of a team of beach litter pickers. To try and stop all this stuff getting on to our dinner plates. Chips and plastic anyone? The other reason, the most important reason, is that New Brighton has some great beaches and coastline. Keeping it litter free is a mammoth job, but at least it’ll be nice for everyone to enjoy. Friday: It was quite a high tide last night, so the beach has been well washed. I know that means a lot of plastic has been swept into the sea. Perhaps one day it will end up as part of one of the 5 enormous islands of plastic waste in our oceans. The Marine Lake has its own plastic Island which is difficult to clear, depending upon which way the wind blows. I get out there early in the morning and drag out bottles, polystyrene, weed tangled with discarded crabbing-line, plastic bags and a few unrecognisable things all mixed in with seaweed. But it looks nice when it’s done. I remember reading, a few weeks ago, that every bit of plastic ever made is still in existence. I reckon a good proportion of that is in New Brighton! Saturday: It’s another warm and sunny day and the visitors stream into New Brighton. As usual there is nowhere for many of them to park. No-one seemed to think that the new development would mean more cars and more litter. Not enough bins either. I meet up with our group for one of our regular Saturday beach cleans. There is a great camaraderie because we all know we are doing something which is good, even when you feel rubbish about it. We collect 11 big bags of litter. Well done everyone. Get home tired but pleased and the cup of tea is very welcome! Sunday: Day of Rest? Day of Worship? Day of Recreation? Day of, well… not litter picking. I feel that a Day of Feet-up is in order. Monday: …… Sunday was busy in New Brighton ………….. FACT (Families and Communities Together) parent support based at New Brighton Primary School’s little house on Vaughan road have lots on our calendar for the next couple of months and would love to see you there. We are very pleased to also be holding another Macmillan coffee morning on Friday 25th September here in our school building from 9.00am until 11.00am. It is such a great charity to get behind and support and we look forward to seeing you. Any green fingered gardeners that have a few hours to spare and would like to help maintain our small educational garden please call our parent support team on 0151 639 3869 and ask for Karen or Emma. The restoration of St James’ spire has begun! In August the scaffolding started going up around the spire of St James’ church. And now no-one in New Brighton can fail to have noticed how Wirral’s tallest church spire has been enveloped in scaffolding, right to the top of its 172 foot height. The purpose is to restore and make safe this nautical landmark, which has had to bear the brunt of storms for the last 160 years. But it won’t be a case of just doing a bit of repointing. No, the spire will be taken down – stone by stone – and then rebuilt. This is necessary firstly because much of the stonework has cracked or fallen away, and secondly because the Victorian cast-iron reinforcing bars have rusted and disintegrated. So the rebuilt spire will contain much new (but matching) stone and will incorporate modern strengthening techniques and materials. In other words, it will be good for another 160 years (at least!). The spire should be completely dismantled by mid October. Imagine the skyline of New Brighton without St James’ spire! It will be a sight which no-one has seen since 1854. But get your camera ready because that sight will be short lived; the restored spire will start to be built immediately, and should be completed early in the New Year. The cost of the work is over £400,000, and you may wonder how it is being financed. Well, it simply wouldn’t have been possible without a grant of £250,000 from the Heritage Lottery Fund. But that still leaves £150,000 which St James’ is having to find through fundraising by various means. Our fundraising campaign is called inSpire, which consists of concerts, fairs and other events. Do look out for inSpire events and support any that appeal to you. And if you want to simply give a donation, you can do it through the Just Giving portal on the church’s website, www.stjameswithemmanuel.com. The restoration of the spire will secure the future of St James’ and ensure that the church continues serving the New Brighton community for generations to come. If you haven’t visited St James’ yet, please do so – it is open every day, and there will be someone from the church or the New Brighton Heritage and Information Centre to tell you about its magnificent architecture and history. Groups or societies can even arrange to have guided tours; simply go to the “Contact” section of our website, send us a message, and we’ll get back to you to arrange a suitable date. We want to share our heritage with the community we serve. During the summer at St Andrew’s we had a week of fun and fellowship during our Staycation. A varied programme of talks, activities and outings was arranged for anyone who wanted to come to any or all of them. These included talks and photographs about China, outings to Carr Farm, Sefton Park and Eastham Woods, a talk about Upper Brighton at the Heritage Centre and lunch at a café on the prom. If you missed it this year, look out for news of next year’s programme. Before that, however, during the October half term (26th -30th October) there will again be a Holiday Club each morning from 9.45 to 12 noon. This year the theme is “Monsters Stink!” All children of primary school age are very welcome. St Andrew’s United Church will again be open for Heritage Open Days. If you’ve never been inside, take the opportunity on Sunday, 13th September 2.00 to 4.30 pm. You may well be surprised! All our regular activities have started again after the summer break. A new partnership of organisations, businesses and groups in New Brighton has been boosted in its ambitions to further regenerate the resort with the award of a grant from central government. The group, New Brighton Coastal Community Team, has been awarded £10,000 to develop an economic plan for the area. Work is now underway with local residents, businesses, visitors to the area and other interested parties over the coming months to help produce an economic plan which will be published at the end of January 2016. In the interim the Coastal Community Team is exploring funding opportunities to help progress initial priorities for the area. The collective vision for New Brighton is that it builds upon its strengths to become a year round premier destination, attracting increased day trippers and overnight stays and increasing employment, whilst supporting and responding to the needs of the local community. A group of locals of varying dancing abilities decided dancing in the open air instead of often hot dance venues would be wonderful. Friends of Vale Park and the Council agreed to let us use the Bandstand and Friday evenings have seen up to 40 odd people [we’re not that odd] dancing taking in river and park views as we do so. The weather has stopped us on a couple of Fridays and the dark nights and even worse Autumn weather will mean moving [rythmically] indoors soon. But we plan a big relaunch come Spring and hope we have started something that will continue in Vale Park for years to come. For more information email alexmay62@hotmail.com and look at the Streetlife website for updates. The workshops are held at 2 p.m. in the Conference Room adjacent to Wirral Archives, at the address below. If you would like to book a place just e-mail me or ring 0151 606 2929. With the strange weather that we are having this Summer it is perhaps not that surprising that some of us are already thinking of Christmas! OCC is the world’s largest children’s Christmas project and is a Christian organisation. “Each shoebox is an unconditional gift, given to a child with nothing asked for, or expected in return; no pledges, no obligation to go to church or attend classes; ‘no strings attached’. These shoebox gifts are an expression of God’s love to us, and the gift of His Son Jesus at Christmas.” (Quote from the OCC web-site). Since 1990 the project has brought the joy of Christmas to more than 100 million boys and girls throughout the world. Last year the total number of boxes sent from the UK was 850,638; this year we would like that number to be 1,000,000! If you visit the OCC website (http://www.samaritans-purse.org.uk/what-we-do/operation-christmas-child/) you will not only find out more about the organisation but also find ideas and materials to help you to incorporate Operation Christmas Child into the curriculum. You can also visit the OCC Facebook page – where you will find ideas and encouragement. If you would like to know more about OCC, contact me on (OCC_Wirral@outlook.com or 07955383692; leave a message and I’ll get back to you). We are always happy to answer questions and we have speakers who are more than happy to speak to groups, small or large, about OCC. New Brighton residents are being given another chance to get their finances in order with a popular free course being run by a local church. Members of New Brighton Baptist, who have been trained by UK charity Christians Against Poverty, are again running the three sessions aimed at helping the local community to best handle the current economic downturn. New Brighton Baptist is one of more than 1,000 churches of different Christian traditions across the UK who are regularly offering the course, as they work together to positively impact the communities around them. The next course takes place at The Haven, 142 Seabank Road, starting at 7.30pm on Wednesday 7th October. elling but mostly the courses are run by churches where congregations want to do something to empower people to fight poverty before it hits. ounselling CAP centre in 500 towns and cities across the UK by 2015. For more about CAP see www.capuk.org. Despite our current building works programme, the church remains open everyday for personal visits, 8am-8pm, even if sometimes people must use the side door as the contractors work at the entrance. Progress of our second Heritage Lottery Funded Project is well underway. Most of the work is on the West gable end roofs, brickwork repointing with lime mortar for breathability and windows. Loose plasterwork has been removed and concrete repaired. The windows being restored include the large rose window above the choir loft and ground floor windows in the porch, baptistery and one confessional. One of the big improvements will be the addition of a large glazed screen below the choir loft making the main church warmer and a smaller screen in the porch to form an Information Point/Piety shop. Once completed, we will need volunteers to help organise and run the shop. Completion of this project is due end October 2015. Part of the project is organizing activities to engage more people in the building. We rely very heavily on our wonderful volunteer workforce who help welcome people to the church and give guided tours. This is particularly important during the Heritage Open Days from 5th-13th September, but at other times too when many groups arrange visits to the church. If you are interested in either visiting or helping, please email contactus@domeofhome.org or phone 07743235046. People don’t have to visit in person to engage with our church. We have a website which is updated regularly, see www.domeofhome.org and have engaged Wirralcam to fix live webcams on the roof of the church to see the views. At the moment there are 3 test cameras that were put in place for the Three Queens May Bank Holiday Event. We saw over 15,000 hits in one day. For the best vantage of the river, click on our website picture on the home page to link to the three cameras. Watch carefully for a high definition view in October. Heritage doesn’t have to be just dates and facts, but the most interesting is people’s personal heritage. We have had lots of fun collecting oral histories about The Dome of Home to make a film for our website and new Information Point. Thank you to all those people who have contributed to our film about the Past/Present/Future of the church. If you have a fascinating story that you don’t want to lose, please contactus@domeofhome.org or phone 07743235046. The church of Ss Peter, Paul and St Philomena is staffed by an international order of young priests called The Institute of Christ the King. This year, 11 young men were ordained to the priesthood at their mother-house in Florence and we are delighted to welcome our own newly-ordained Englishman, Canon Scott Tanner, to The Dome, as curate to help our rector, Canon Montjean. Canon Tanner will be celebrating his first Solemn High Mass at Ss Peter, Paul and St Philomena’s on Saturday 31st October at 10am in the company of his superior and founder of ICKSP, Mgr. Giles Wach. All are welcome to this very special event, which will be followed by a social. We are pleased to say that the fairy folk have been welcomed into the Vale Park community, during the summer visitors have arrived from all over Merseyside and beyond. 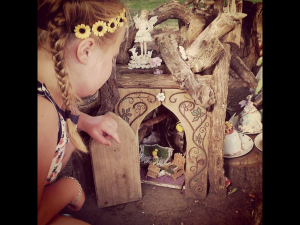 Our fairy village has spread its magic to believers of all ages, it gives pleasure to all who capture the excitement on young faces as they scurry from door to door looking for Tinkerbell and her ‘ friends, its just amazing to watch. 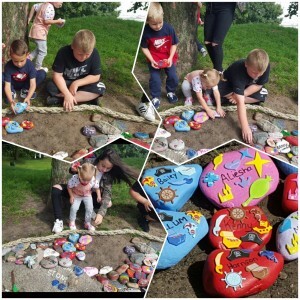 The children have been encouraged to created their own pieces of art by collecting stones from I the beach, painting them and displaying their creations inside the belly of the great whale which lies at the entrance to the fairy glen. As you can imagine because of the Liverpool Echo, waiting magazine and Facebook the word is spreading about our garden many, many would be Fairies visit Vale Park and then transform into swashbuckling pirates aboard the Black Pearl. This we feel is doing its part to help rejuvenate the New Brighton area and show the rest of the world what hidden gems our beautiful peninsular holds. Because of the success of The Black Pearl and our fairy garden much needed restoration work needs to be carried out and this will take place over the winter period. We have to say a massive thank you to all the people who respect the work that has taken place to create the fairy village and of course the Pirate ship…. Not so fortunate has been the fairy village in Buncrana, Donegal, which was our inspiration for the garden, vandals have caused considerable damage. So a warning from the wee folk of Swan Park in Ireland has been put in place. Waste less, live more week returns for 2015 from 21 – 27 September. Wasting less and living more is about rethinking how we live our lives in ways that reduce our environmental impact whilst improving the health and happiness of ourselves and each other. Each year Keep Britain Tidy, together with organisations all over the country, invite people to take positive action for themselves and the environment through the Waste less, live more week challenge. Last year over 6,500 people took part in the challenge and this year we want even more, so why not sign up today, it’s easy. We’ve created a challenge pack with 51 suggested waste less, live more activities. Pick one or more and get your friends, family, neighbours or colleagues to do them with you.